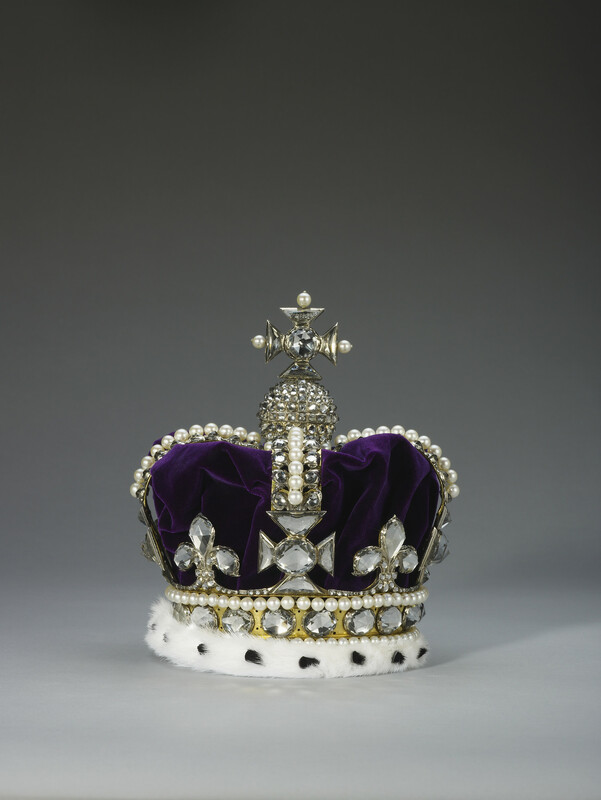 The crown is composed of a gold frame, set with rock crystals (quartzes) in closed silver collets, and with cultured pearls, and fitted with a purple velvet cap with an ermine band. The frieze is set with eighteen oval rose-cut crystals between rows of pearls, supporting four fleurs-de-lis and four crosses-pattée composed of large crystals, and a narrow festoon of rose-cut crystals. The four half-arches are each set with a central row of pearls, flanked by rows of rose-cut stones, supporting a pavé-set monde and surmounted by cross-pattée, the arms terminating in pearls. The rock crystals in this crown replace the diamonds which were hired for the 1685 coronation and subsequent ceremonies. This crown was the first consort's crown to be made after the Restoration of the monarchy in 1660 and was supplied in 1685 as a State crown, together with a Coronation crown. The jeweller, Mr Richard Beauvoir, who created the crowns, was described in a contemporary account of the coronation by Francis Sandford as having 'the honour to please Their Majesties in a high degree'. The crown was reset with jewels for each of the coronations of Mary II in 1689, Queen Anne in 1702 and Queen Caroline in 1727. After this the consort's State crown was replaced - first by Queen Charlotte's nuptual crown, and then by a new crown designed for Queen Adelaide in 1831.